I am a day away from my day long, continent spanning trip to reach the Salt Palace in Salt Lake City, Utah. I leave at quarter to 10am EST and arrive at quarter to 10pm MST. So technically it will look like 12 hours, but in reality, it will be more. On the way I get to meet a childhood friend in LA for lunch, and on the way home I get to play in Vegas with a WikiTree colleague. No, I didn’t plan it that way but when I realized I would be in LA for a good chunk of time and in Vegas for an even bigger chunk of time? Well things just fell into place. Then, because I am flying West Jet home from Vegas, I will be able to watch, for free, from the back of the seat in front of me, the Super Bowl. Go Bron..Pan..oh how do you choose? Peyton Manning’s probable final game/Super Bowl appearance, or, roll Panthers after one incredible season? I will be at the WikiTree booth, sporting my burnt orange with pride, giving out as many hugs as I can, while taking selfies with anyone who will take one with me AND posing for pictures with some of my favorite WikiTreers in WikiTree’s photo booth! I will try to sneak in some classes in betwixt and between talking to every single person attending Roots Tech, about how incredible WikiTree has been for my Genealogical journey. I will also tell anyone who will listen about how excited I am to have teamed-up with Marc Snelling to start Grandmas Genes and how much fun I am already having working on blogging, Tweeting, Facebooking as Grandmas Genes…I am becoming a social media Maven. See you at Roots Tech! DNA is the thread that makes up the fabric of who we are. It is also the tint in our Iris, the gray (what, you aren’t grey yet?) of our hair, the knock of our knees, the recipe of our self. It is also the road map of our ancestry. I have, according to Doodle my Grandmother, my grandfather Gaulden’s hair and eyes. I can see in the mirror that I have my mothers smile. All of my siblings and I have the same basic build, in varying degrees, of our grandfather TC. One sibling has curly brown hair and resembles, again according to Doodle, Doodle’s mother Allie Compton. The other sibling is some kind of incredible replica of TC. I know that I see my sibling in the face and expressions of my niece. I also see the same niece in the face of second cousin. All our family traits, everything is inherited and that inheritance is decided by our DNA. So in the simplest form DNA is hundreds of millions of very small things found in a cell – each cell in our bodies. How these tiny things are are set-up is how our body knows how to be. This is the basic thing to know. We inherit parts of us from our mothers and our fathers. We also inherit parts of us from our grandparents and their parents and their parents and…HOW we inherit it is much harder to explain. If we all inherited things only from each of our parents then we would all look just like our parents and each of our siblings. But as I discussed above, I don’t look just like my brother or my sister. I don’t look just like my father or my mother. I don’t look just like any of my grandparents. I look just like a random combination of all of, or parts of, different ancestors from the beginning of my family line(s). So, I can ask my family questions and find out about my family history. I can be told I have my grandfathers eyes…wow I must have inherited them from him…but who did he inherit them from? Well, no one is alive today to tell me that. No one is alive to tell me who his father was from first hand experience either. I can go to the Library, County Archives, State or Provincial Archives and the National Archives and find the paper trail. The paper trail may or may not tell me anything further back than what the papers cover, but how can I find out about the rest of the story. Technically a DNA test won’t tell me who I got my eyes from, but it can tell me that I have blue eyes based on what my DNA test says. A DNA test can also tell me that my mother is my mother (despite how many times my sister told me I was adopted), that my grandmother is my grandmother and that her great, great, grandmother is really her 2xgreatgrandmother. To connect the DNA with the paper trail, to prove that trail, is basically the found holy grail of our family history. 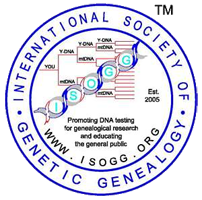 Author magsPosted on January 31, 2016 September 6, 2016 Categories DNA, Genealogy, Genetic Genealogy2 Comments on Why DNA? It is wooden and rectangular, about 16″ x 6″ x 6″ or so. It is hinged at the back and has a rough clip at the front to keep it closed. The top is adorned with carefully written white letters. “J superscript N then McElmoyle”. The letters in the name McElmoyle are faded or worn, but they are there. The whole box is battered a bit, dripped with something in spots, dirty and dusty. It spent at least 40 years or so in the attic of a McElmoyle descendant in Greenville, South Carolina. About 80 miles from it’s original owners home in York, South Carolina and close to 4000 miles from it’s origination point in Antrim County, Northern Ireland. 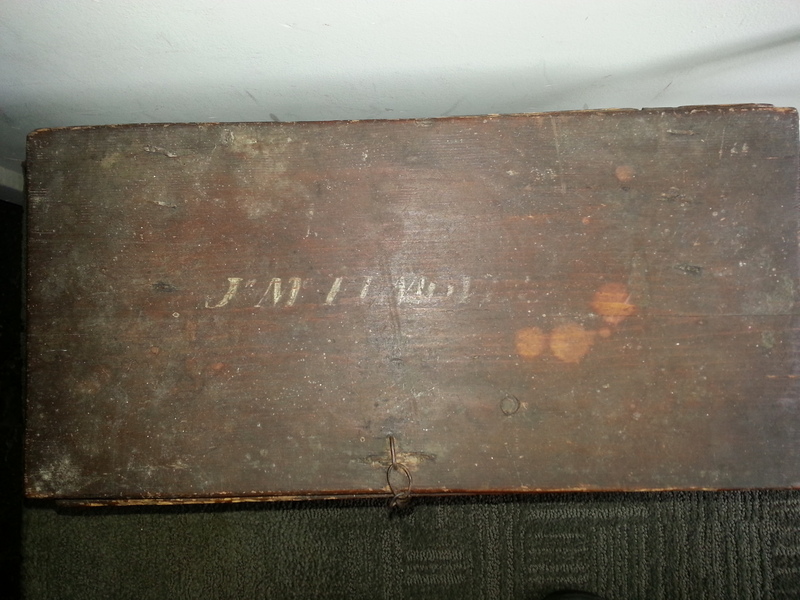 John McEmoyle carried all of his worldly possessions in this box when he arrived in South Carolina in the late 1700’s. Who knows what those original contents were. The contents it held in recent times were an original copy of the Immigration and naturalization records of John McEmoil (McElmoyle), Sr.
As Irish inheritance goes, this box would have been inherited by the first son of John, then the first son of that son and so on, on down the line. John McElmoyle, Sr. had five living children proven by his 1811 Will. The first son would be James, who according to the McElmoyle Family Papers was “single, may have been an invalid” and “deaf and dum”.. The 1850 Census of York County, South Carolina lists him as living with his brother Daniels’ Widow Elizabeth, her new husband John D. Boyd, and his niece Harriet E. McElmoyle. John Getty’s, also listed, must be related to his brother Daniels’ daughter Mary Adaline McElmoyle Gettys. So it seems James would have no male heirs to leave the box to. The next son, Daniel has plenty of heirs. He dies early, his Widow remarries and the children are raised by their step-father. They might have had the box. Daughter Margaret McElmoyle has no information suggesting she lived and breathed other than her 1812 inheritance from her father. Sons: James and John, the plantation containing 200 acres. Son: David, 140 acres on Turkey Creek, purchased from Abraham Livingston. Daughter: Margaret McElmoile, the lease of 70 acres Indian land purchased from John White. John McElmoyle, Jr., “…believed to be the youngest, remained single and is believed buried at Rose Hill Cem. in York, SC as J.C. McElmoyle, died Feb. 2, 1884 aged 84 yrs.” This, again, is from the McElmoyle Family Papers. He does not appear to marry and lives with a niece in Census records from 1860 to 1880. And then there is David, who like his sister Margaret, has no information suggesting he lived and breathed other than his 1812 inheritance from his father. That McElmoyle Descendants great grand father was, according to the McElmoyle Family Papers, “probably a cousin [to John] who may have immigrated at later date. He too is buried at Bethesda…Do not confuse his descendants with Daniel son of John Mc. Senior.” How on earth would a descendant of a cousin of the John McElmoyle, Sr. family inherit the box and it’s contents? 1.↑ McElmoyle Family Papers, p.1,No Author, 1978, NCR, Public Library of Charlotte & Mecklenberg County, Charlotte, North Carolina. 2.↑ McElmoyle, john (Sr.), Vol.1, 1770-1815, p. 466, Indexes to the county wills of South Carolina. York County Wills, p. 9, Mid-Continent Public Library, South Carolina – Probate records – Indexes. 3.↑ McElmoyle Family Papers, No Author, 1978, NCR, Public Library of Charlotte & Mecklenberg County, Charlotte, North Carolina. 4.↑ “United States Census, 1850,” database with images, FamilySearch (accessed 10 November 2015), James Mcelmoyl in household of John D Boyd, York county, York, South Carolina, United States; citing family 1496, NARA microfilm publication M432 (Washington, D.C.: National Archives and Records Administration, n.d.). 5.↑ McElmoyle, John (Sr.), Vol.1, 1770-1815, p. 466, Indexes to the county wills of South Carolina. York County Wills, p. 9, Mid-Continent Public Library, South Carolina – Probate records – Indexes. Oh to Start. Well that is what it all comes down to right? Nothing gets done unless you just start. Marc and I are doing just that. We have known each other for a couple of years. He and I live in the same neighborhood. His sister is in my life “circle’s”. You know, those people you probably interact with at least weekly, but they aren’t really a “friend”. A neighbor who shares a fence, the fella at the butchershop you end up having long discussions with occasionally while shopping, the manager at your favorite store who patiently listened to a special request, made it happen and you always go out of your way to say hello.